Wedding ceremonies are the most intimate, special part of the wedding. As it goes, wedding decorations are reflective of the couple and their personality. 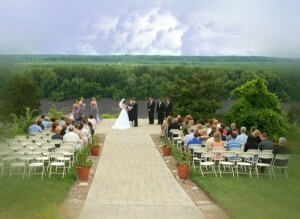 The wedding ceremony is where the attention will first go, and gives a preview of how the reception will look like. Wedding ceremony decorations should be kept simple and within the theme of the entire wedding, so that the focus will all go to the event itself, and to the bride and groom. At most, churches or ceremony decorations should be muted and should enhance the location, and not be too loud or distracting. Here are some tips for wedding ceremony decoration that you can use, for both indoor and outdoor wedding ceremonies. 1. There are many ways a ceremony can be made to look extra special for this special day, and one way is adding flowers. Place bouquets of flowers around the pillars of church, carefully tied with delicate and sheer ribbon. Flowers are also placed along the aisle in the church, by the entrance, and hung in various strategically chosen areas of the ceiling. By the altar, pillars can also be wrapped with lace and tulle, and touches of flowers but not too extravagant. White is an excellent choice for wedding ceremony decoration flowers; it adds to the innocence of the whole event. You can add subtle color and make white the dominating theme with greens to enhance it, or using the two or three colors of your wedding theme. The colors used for venue decoration should never be too far from the colors of the bouquets used, so that there is harmony. If you are getting married in Christmas, use Christmas wreaths to decorate the ceremony as well. Seasonal themes are a great way to decorate your wedding. Place wreaths on doors and a few on walls, so as not to overdo it. 2. Use soft lighting to give a romantic atmosphere. You can use Christmas lights to light the aisle, and use colorful metallic ribbons to cover the wire. Go ahead and use lights for a contrast, or use them in complementing colors with the rest of your theme. Large candles are a great way to add lighting to the wedding ceremony. If the church is large, big candles are a good idea, to minimize small candles falling and accidents. Torches should be kept at a minimum during wedding receptions, placing them in strategic places such as entrances and exits. Altar torches are a great idea to light up the ceremony. Lights can also be hung on strings or thin ribbons to make outdoor venues more romantic. Tie Christmas lights to light up dancing areas, dining areas, and along the buffet table. 3. Colorful ribbons and lace in various colors can enhance the mood in the church. Use gold, ivory, or silver to drape around flowers, walls, and pillars. More contrasting colors such as deep purple, magenta, red, forest green and dark blue can be added in small amounts. This can be done using two strips of ribbon at the same time, with the gold one being the dominant, thick ribbon, while a thinner colored one is attached with it. Place them around chairs, behind pews, and to tie flowers onto the aisle. 4. Large ribbons in doorways make for a grand entrance and exit. From the outside and inside, ribbons can frame doorways or entrances. 5. Balloons are also a great idea to decorate wedding ceremonies. Balloon bouquets in soft colors such as white, pink, blue, yellow and mint green add touches of color to the venue. Balloons can also be tied to the backs of chairs or sides of pews. In indoor venues, you can also try letting some balloons float in the air. Balloons can also be tied to a wire to form an arch over the wedding cake. Simply use wire to form a dome over the cake area, and tie small balloons around them. Corners of rooms and indoor venues can also use a bunch of balloons. For outdoor weddings, balloons can be a minimal part of the entire design by tying balloons to pillars, gazebos, or tent poles. When designing your wedding ceremony decorations, remember to keep it simple and use things that are reflective of you. This is your special day after all, and planning decorations does not have to be difficult if you keep these pointers in mind.